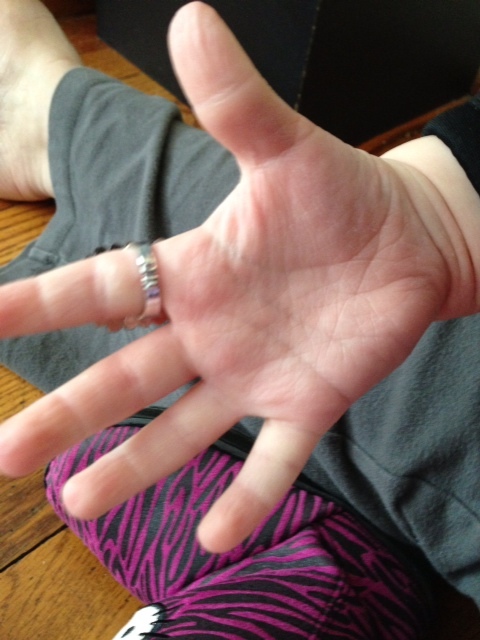 This is a photo of Neve’s right hand. I took it to remind myself that the vast majority of mistakes I make as a parent, and regularly beat myself up about, are minor missteps that won’t permanently damage my 2 daughters. Neve’s hand found, and clutched at, a blade; blood appeared in a small, awful smile across the side of her palm, and she screamed. Being terrible in a crisis, I freaked out, wrapping my arms around her and crying as Joe fetched a wet, cold washcloth. We held the cloth against her hand, and Joe called his father, who’s a doctor; he recommended applying butterfly bandages, so I ran to the CVS down the block, frantically searching the aisles. When I returned, we did our best to clean and cover the wound, then we discussed our next move.